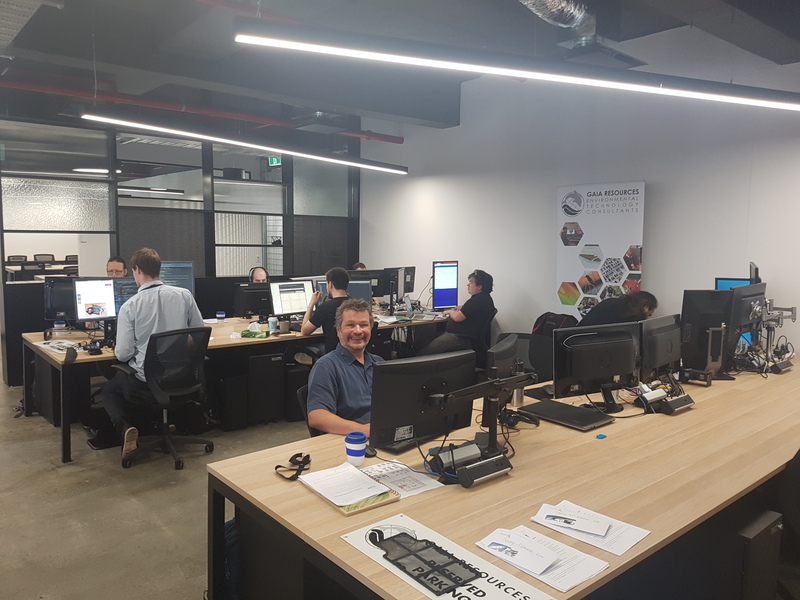 In what was surely one of the smoothest moves I’ve been involved with, we moved our Perth office from our “old” Leederville space to our new digs at Flux over the last weekend. We had to shift over ten years of accumulated equipment, data and memories in this move, and I can’t say it was emotionally easy to do so (I only had “allergies” flare up a couple of times), but physically it went a lot smoother than I was expecting. That smoothness is down to the efforts that were put in by the whole of the Perth team. 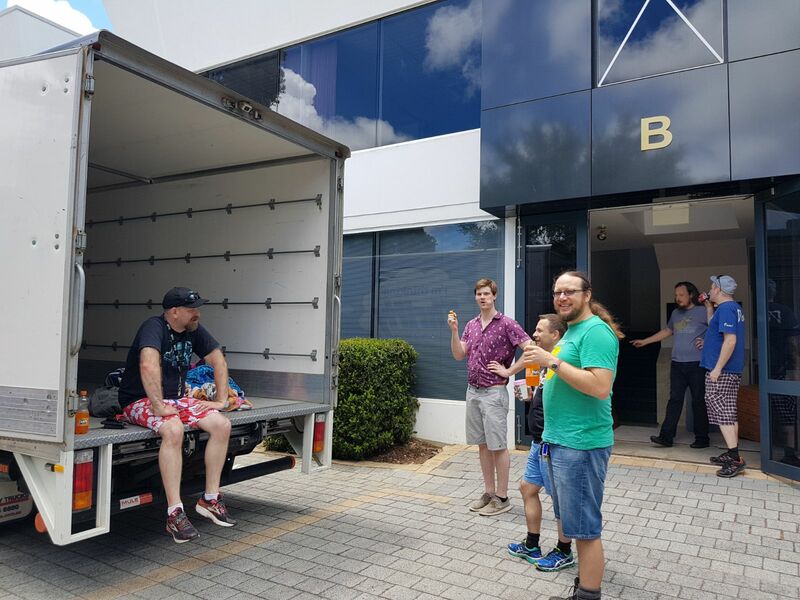 With Tracey, Shay, Andrew and I doing a lot of preparation for the move, we closed down at lunchtime on Friday, and the team packed up their own gear, then set to work packing up all the remaining equipment and gear that wasn’t coming with us to Flux. I have to admit to being just a little emotional seeing my office empty out – I’ve been in the Leederville office for over ten years, and it’s been a big part of my working life. 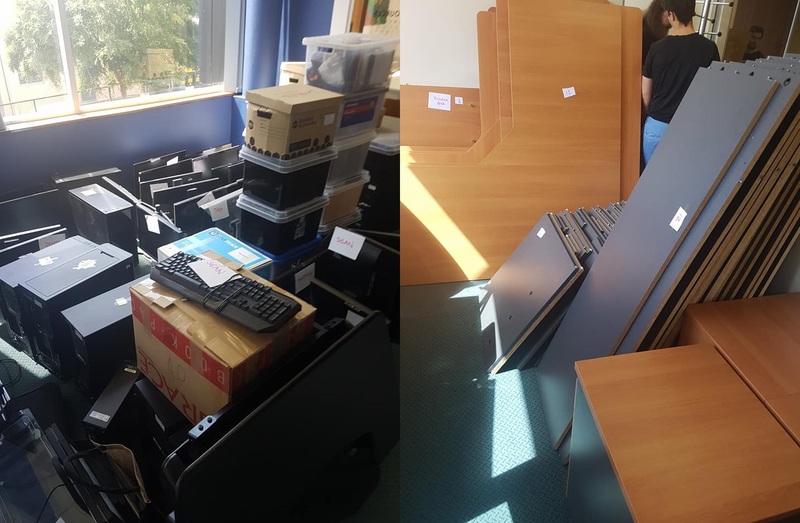 But by around 4pm on Friday (including a break for pizza) we had the office packed and ready to move, thanks to everyone who was in the office and got into the cleanup. Over ten years ready to move! That was quite a lot of work in itself, but that meant when we arrived on Saturday morning with a moving truck we only had two truck-loads to deal with, thanks to Ben filling up his panel van with our e-waste (which was definitely e-waste, as it had been picked clean by us beforehand). 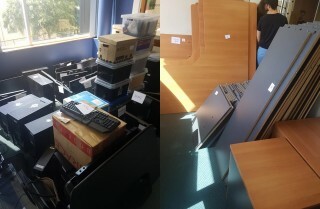 This was all part of one of our aims for the move; to make sure we minimised our landfill. Our first load was the transfer of our key gear to Flux, and that was basically our PCs and a box of “stuff” per person. That means that we’ve greatly reduced the amount of “stuff” we had – and I personally feel that I’m a lot less cluttered here both physically and mentally. A lot of paper ended up in the recycling bins and some had to be shredded first; Tracey has spent a lot of time scanning 14 years of history from our paper archives, and we’re working through that digital preservation (sorry, still in “Archives” mode). 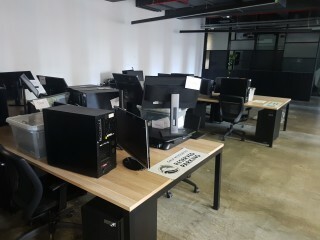 After delivering the computers and boxes it was back to load again for the furniture. We had searched high and low for sensible ways of disposing of the furniture; we were unable to find anyone who wanted to buy it, so we opted for re-use. Eventually, we ended up donating the furniture to a charity, through Western Irrigation, who are storing it while the charity works out how to best deal with it (Western Irrigation is owned by my brother-in-law, who will also make the most of it while it’s there). So after all that planning – thankfully, nothing went to landfill. But it was thanks to our volunteer “move” team of Tony, Gary, Sean, Ben, Kehan, Alex, Serge and Andrew (plus his boys!) that we got through the move so easily (and of course, my wife, Jeanie!). A lot of the bric-a-brac was taken home by the team; useful computer equipment (or not useful, depending on how technical you are), books (the remnants were donated to a second charity), some of the furniture and other gear as well. Even the kitchen crockery and cutlery went to a third charity to help people who needed such gear. We all arrived at Flux on Monday morning to set up our gear, and to be on-boarded in the Flux way, which was a pretty simple process; those that needed it got a tour of the facilities, and then signed some forms to get our access to the building sorted. By 11.30 we were all individually operational, and then with our main onsite drives and printer up and running within a couple of hours of that, we were up and running with less than a working day of disruption. Our phone number doesn’t even change thanks to a diversion. Now that the move is over, we can get back to work – and get into some of the new ways of working that being a part of the Flux community opens up to us. Stay tuned for more from us (via Facebook, Twitter or LinkedIn) about how we are going through another re-invention at Gaia Resources! Hi Piers, well done. Amazing what 80% planning can do… Congratulations and the very best wishes for the next yen years. Hi Piers. How is it panning out? We’ve all heard about the move towards activity-based working within organisations, but is the real co-operative working benefit (productivity / innovation) to be found in a set-up like Flux where you’re constantly rubbing shoulders and bouncing ideas with go-getters from other organisations? It’s going really well so far, Fraser! It takes a fair bit of self-discipline as well to not be distracted all the time by all the opportunities, but the team are enjoying it so far, and still being productive!